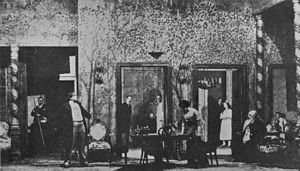 In a box set, such as this one used in a 1904 Moscow Art Theatre production of Anton Chekhov's The Cherry Orchard, three walls are provided by on-stage scenery while the invisible fourth wall is provided by the proscenium arch. The fourth wall is the imaginary "wall" at the front of the stage in a traditional three-walled theatre. In a theatre, the fourth wall is the one through which the audience sees the action of the play. The idea of the fourth wall was made famous by philosopher and critic Denis Diderot. It was used more in the 19th century. The fourth wall extended the idea of an imaginary boundary between any fictional work and its audience. If an actor speaks directly to the audience, does something to the audience, or even simply notices the audience, it is known as "breaking the fourth wall". In a movie, or on television, this can be done by the actor speaking directly to the camera. This breaks a boundary normally set up or assumed by works of fiction. It is known as a metafictional technique. In literature and video games, it happens when a character acknowledges the reader or player. The fourth wall is not the same as a soliloquy. A soliloquy is a dramatic device used by playwrights where the character on stage gives a monologue which gives the audience insight into their thoughts. The acceptance of the transparency of the fourth wall is part of the suspension of disbelief between a fictional work and an audience. It allows them to enjoy the fiction as if they were observing real events. Although the critic Vincent Canby described it in 1987 as "that invisible scrim that forever separates the audience from the stage". "... stood across the road from his subjects and observed. Often enough there are a number of individuals in a crowd peering back at him. They invite us momentarily into their world, like characters on a stage sometimes do, breaking the fourth-wall illusion." McKellen said that "Lowry’s mid-air viewpoint is like a view from the dress circle", looking down as if to a stage. And, McKellen argues, Lowry "often marks the limits of the street scene with curbstones or a pavement that feel like the edge of the stage where the footlights illuminate the action." The metaphor of the fourth wall has been used by literary critic David Barnett to The Harvard Lampoon's parody of The Lord of the Rings. He says a character breaks the rules of storytelling by referring to the text itself. The character Frodo observes "it was going to be a long epic", which in Barnett's view "breaks the fourth wall. Woody Allen broke the fourth wall several times in his movie Annie Hall. Allen explained, "because I felt many of the people in the audience had the same feelings and the same problems. I wanted to talk to them directly and confront them." On television, breaking the fourth wall is rare. It has been done throughout the history of the medium. George Burns did it many times on the 1950s sitcom he starred in with his real-life wife Gracie Allen. It's Garry Shandling's Show and Mrs Brown's Boys both have their title character walking between sets mid-scene. The latter shows characters re-doing the same scenes over when they missed a line of the dialogue. Another television character who regularly breaks the fourth wall is Francis Urquhart in the British TV drama series House of Cards, To Play the King and The Final Cut. Urquhart talks to the audience several times during each episode. He gives the viewer comments on his own actions on the show. The same technique is also used in the American adaptation of House of Cards. ↑ 1.0 1.1 Bell, Elizabeth S. (2008). Theories of Performance. Sage. p. 203. ISBN 978-1-4129-2637-9. .
↑ 2.0 2.1 Wallis, Mick; Shepherd, Simon (1998). Studying plays. Arnold. p. 214. ISBN 0-340-73156-7. .
↑ "The Fourth Wall and the Third Space" by John Stevenson, creator of Playback Theatre. ↑ Abelman, Robert (1998). Reaching a critical mass: a critical analysis of television entertainment. L. Erlbaum Associates. pp. 8–11. ISBN 0-8058-2199-6. .
↑ 6.0 6.1 "Sir Ian McKellen: My lifelong passion for LS Lowry". Telegraph.co.uk. 21 April 2011. Retrieved 12 March 2015. ↑ David Barnett. "After Tolkien, get Bored of the Rings". the Guardian. Retrieved 12 March 2015. ↑ Björkman, Stig (1995) . Woody Allen on Woody Allen. London: Faber and Faber. p. 77. ISBN 0-571-17335-7. ↑ "The George Burns and Gracie Allen Show". TVGuide.com. Retrieved 12 March 2015. ↑ Dessau, Bruce (1 March 2011). "Mrs Brown's Boys: mainstream comedy for the middle-aged". The Guardian. ↑ Cartmell, Deborah (2007). The Cambridge Companion to Literature on Screen. Cambridge University Press. p. 244. ISBN 0521614864. ↑ Macaulay, Scott (24 April 2013). "Breaking the Fourth Wall Supercut". Filmmaker. Retrieved 17 December 2014. This page was last changed on 2 April 2018, at 00:36.